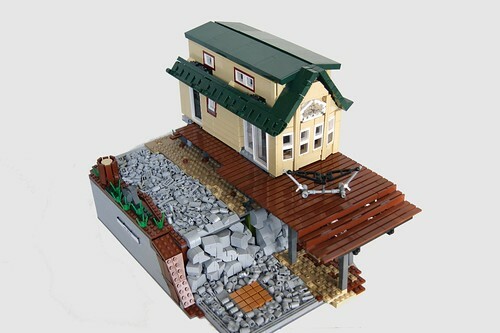 Brick Town Talk: Happy Campers - LEGO Town, Architecture, Building Tips, Inspiration Ideas, and more! Amboy, Washington - (BTT) Ah, the great outdoors. There are those who prefer roughing it - tents, campfires, bears, mosquitoes - but this author prefers a vacation heavier on the creature comforts than the creature invasions. With the comfortable hammock on the spacious wood deck, the striking green roof which keeps the weather outside where it belongs, and plenty of windows affording unbeatable views to Mount St. Helens, this cozy mobile home lets you get as close to nature as you really need to get.